Team substitutions, point penalties, and big upsets at Oakcliff International’s first day of racing. Oyster Bay, New York – Less than 24 hours before the racing was scheduled to start, Magnus Sandberg was forced to withdraw from the event due to an unexpected family emergency. Conveniently, his local sparring partner, Chantal Hearst, was able to step up and fill in Magnus’ spot. Worth noting: Hearst is the only female skipper in the event; is sailing with her two brothers, Jason and Keith; and is steering with a wheel for the first time. Says Hearst about stepping onto a new team, “I felt a little transplanted,” but she later indicated the she gained confidence as their intra-team communication became increasingly fluent throughout the day. The Match 40s also posed new problems for her, being accustomed to much smaller boats. When judging overlaps and the start line, Hearst “really [doesn’t] know where the bow is.” Other skippers suffered from the same challenge, as the Match 40s are the largest boats sailed on the international match racing circuit. The high intensity of match racing forces close situations and, unfortunately sometimes, contact between boats. Oftentimes the incidents only resulted in an on-the-water penalty to one of the teams involved, but three collisions were deemed by the Chief Umpire, Bruce Cook, to be deserving of an additional half-point scoring penalty. It is no doubt that the teams vying for the top spots in the Grand Slam Series are taking this risk into consideration. Newcomer the to Series, Chris Poole, is sitting in first, winning 7 of 8 very tight battles. In his race against Ashlen Rooklyn, Poole says he “stayed close when [the wind] went super light and shifty” and “waited for the perfect opportunity to come out on top.” This confidence, combined with patience, in the winds that ranged from 15 to 6 knots and back up to 30 are in part due to Poole having enlisted the help of Dave Perry for this event. With Perry keeping his head out of the boat and making all of the tactical calls, Poole was able to “get back to his old sailing habits and…just drive the boat fast” while relying on his team’s experience on the Match 40s to make the maneuvers happen. Rounding out the top five behind Poole’s Riptide Racing are David Gilmour’s Team Gilmour, Nicolai Sehested’s TRE-FOR Match Racing, Eric Monnin’s Okalys Corum Sailing Team, and Chris Steele’s 36 Below Racing. Gilmour, Steele, and Sehested are all fighting for the top spot in the Series’ cumulative standings. Make sure to watch Molly Riley’s video to meet all of the teams here: http://vimeo.com/73860533. 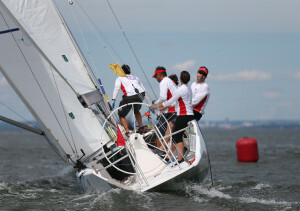 For more information about the Oakcliff International, visit www.oakcliffsailing.org/racing/oakcliff-international. Live updates during the event can be followed here: https://twitter.com/OakcliffSail; photos and other posts can be followed here: https://www.facebook.com/Oakcliffsail; and results will be posted here: http://www.matchracingresults.com/2013/usa-grand-slam-oakcliff-international/.